GRAND CANYON — unless you have stood at the rim and looked down, it is impossible to understand how rugged and impenetrable Grand Canyon is. From horizon to horizon, the Canyon presents a continuous labyrinth of plunging chasms, soaring buttes, and sheer, multicolored walls. Early explorers in this water-starved land must surely have felt despair as they gazed longingly at the Colorado River, an all-but impassible vertical mile below. For over two hundred fifty miles, this wild stretch of the Colorado River was a giant blank spot on the map, prompting Samuel Bowles' famous 1868 quote, "Is any other nation so ignorant of itself?" To answer that challenge came Major John Wesley Powell, a one-armed veteran of the American Civil War who sought to be first to navigate the length of the Colorado through the Grand Canyon. From the headwaters of the Green River, Powell and his men made it all the way to the confluence of the Colorado and Little Colorado Rivers on August 10, 1869. They had already faced many hardships in their pioneering journey, including the loss of one boat and a third of their provisions. Now, at the gateway to the Grand Canyon, Powell knew he and his men faced an uncertain future. "We have an unknown distance yet to run, an unknown river to explore. What falls there are we know not; what rocks beset the channel, we know not; what walls rise over the river, we know not. The men talk as cheerfully as ever; but to me the cheer is somber and the jests are ghastly." While camped at the Confluence, Powell's brother, Walter, decided to try to find a way up to the rim. Ostensibly, this was to measure (via barometer) the height of the cliffs above the river. Given the expedition's precarious circumstances, however, it seems reasonable to suppose Walter was also looking for an escape route. 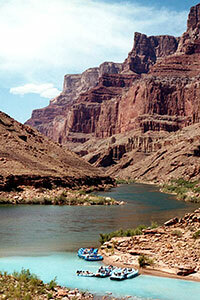 Of course, there were hidden routes from rim to river in the Grand Canyon, discovered through the ages by native peoples. But at the time of the Powell expedition, most of these routes had been long forgotten. As Powell and brother Walter scouted the canyon's walls from the Confluence, they would have seen little to suggest any possibility of exit. Thanks to Powell's journal, we know Walter succeeded in reaching the rim—a remarkable achievement without a map in any era. After a few days of rest, John and Walter Powell and the rest of the expedition resumed their journey down the unexplored Colorado on August 13, 1869, and so ensured their place in history. Today, Walter's climb from the Confluence to the rim is known as the Walter Powell Route, and it remains a challenging but obscure scramble in perhaps the most remote, rugged, and scenic part of the Grand Canyon—if you can find it.